Objective: New York City-based Broadway Interactive Group, a new subsidiary of Broadway Video (a video and television design, editing and production facility), produces CD-ROMs on a variety of topics. Ultimo Incorporated was asked to quote on designing and producing its capabilities kit and services information sheets. Ultimo quoted a fee based on a four-color, pocket-folder format, 9"x12" in size. Challenge: After receiving Ultimo's estimate but before the project began, the client contacted Ultimo with an update: Needs were changing for this start-up company. The kit may or may not need to hold a demo VHS reel; it may or may not need to hold a CD disc. A potential client might get printed materials, a VHS and a CD, or only printed materials or just the VHS, depending on many factors. The combinations were endless, it seemed. Solution: Ultimo responded to her client about the budget first, saying, "Allow us to come up with a unique design and production solution, and we will work with the previous budget relative to our in-house fees (within reason). But you are responsible for paying all production and manufacturing expenses." The client agreed. While working with the original quote would normally have been out of the question, the studio's experience with Broadway Video had shown them to be excellent design partners, whose innovativeness supported design creativity. No budget existed for buying photography, illustration or retouching. Only one thousand pieces were needed at the time. Each kit would be customized based upon a prospect's needs and interests. The kit had to be able to contain some or all of the promotional materials without ever looking empty when pieces were missing. Production resources had to be used thoughtfully: The designers and the client agreed to use recycled paper and vegetable-based inks. The kit had to be mailable without damage. The designers overcame the project's lack of imagery by letting size and paper create the needed visual impact. They sized the folder at 6" x 9", half the standard size, and produced it from industrial-weight 100 percent recycled, 100 percent consumer waste kraft board. 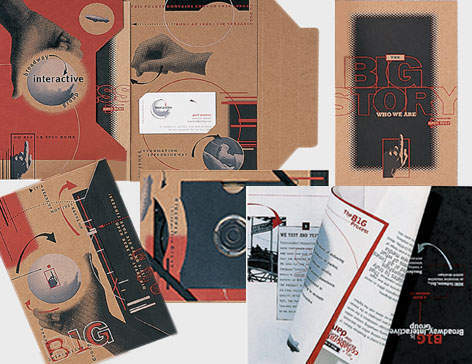 Inside the folder, a booklet containing the capabilities/company information, various press sheets and letterhead would slip into horizontal pocket; a business card would attach to one of the panels. The folder could work as a self-mailer or in conjunction with the demo materials. For those times when the kit needed to contain the printed and the demo materials, Ultimo and Spence designed a modular, single-die kraft board form. Two of these forms would slip over the demo's front and back surfaces, before the demo was paired up with the 6" x 9" capabilities folder. Both pieces were then wrapped with a black elastic band and slipped into a 11" x 13 1/2" kraft board envelope. By using the same weight kraft board and printing red and black on the form, folder and envelope, the designers created unity and saved time and money. Aphorisms and manipulated found art reflect the company's services and personality and add a graphic impact.